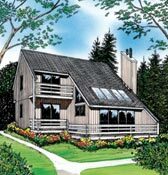 This passive solar design is suitable for vacation or year-round living. The rear or southern elevation of the home is highlighted by an abundance of decks and glass. A minimum of windows are found on the north, east and west sides. 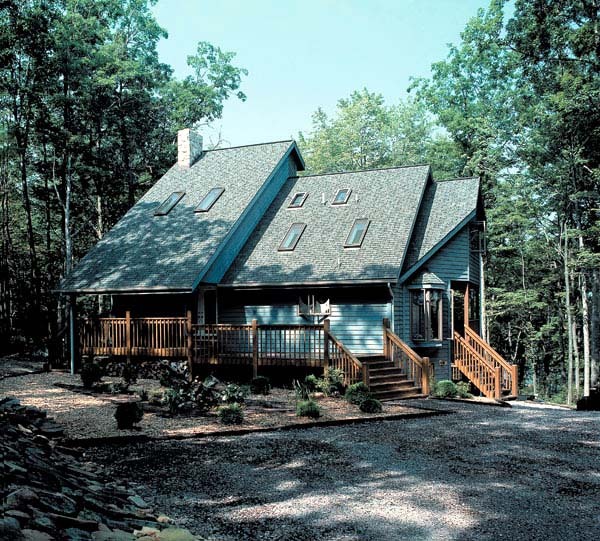 The basement level has a large shop, storage and recreation areas, plus a bedroom. The first-level living room is two steps up from the rest of the first floor, with two stories of glass on its southern wall. An angled wall lends character to the kitchen/dining area. The master suite occupies the entire second level with its own bath, dressing area, walk-in closet, storage nook, and private deck. This home is designed with a basement foundation.